Waterfalls are one of the most popular sights and destinations in Great Smoky Mountains National Park. Grotto Falls is unique as the only waterfall in the park that you can walk behind – the trail passes behind the water drop. It’s a relatively short hike and you can get there and back to your rental cabin in just a few hours time. Grotto Falls is a 25-foot tall waterfall, and a good place to practice your nature photography skills – do bring a camera. You can follow the trail behind the waterfall itself to see things from a completely different perspective, and you may meet some llamas. This trail leads to Mt LeConte Lodge, and llamas are used as pack animals to carry supplies up – if you’re lucky you may see this exotic pack train passing through. The hike to Grotto Falls is part of the Trillium Gap Trail, which connects to a number of popular hiking trails in the area. This is a great trail because it offers large parking facilities at the trailhead, and it starts from the Roaring Fork Motor Nature Trail, the famous driving trail, easily accessible from Gatlinburg, and an experience in its own right – not to be missed. This scenic drive gives you a snapshot of the incredible variety of nature around the Smoky Mountains without having to step out of your car. Grotto Falls is a very popular destination, so expect to encounter some crowds on the trail and in the Falls area itself, especially when the weather is nice. In the Smoky Mountains, starting early in the day is always good advice. The good news is that slowing down gives you more time to take in the scenery. The Falls are loud, by the way – the waterfall drops into a pool with a continuous roar. It’s a powerful and exciting place. 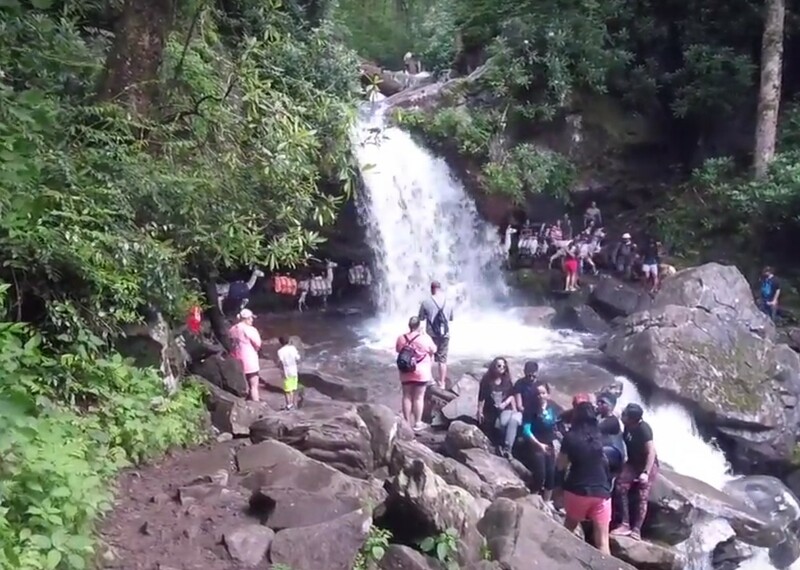 The total round-trip distance of the hike to Grotto Falls and back is less than 3 miles, and it’s rated between easy and moderate depending upon your level of hiking experience. There are some rocks and tree roots that you need to watch out for, but it’s mostly a pleasant walk through the beautiful old-growth hemlock forests that are a hallmark of the region. There are some streams to cross on foot, and you are accompanied by rushing water cascading downhill as you approach the falls area. Whenever you’re venturing outdoors in the Great Smoky Mountains, safety is the first priority. The trip to Grotto Falls is safe for the entire family, but there are some considerations you need to make. Proper footwear is a necessity when you are going on a hike of any distance. Make sure your shoes or boots are sturdy and have adequate ankle support, and avoid open-toed footwear on the trail. Against all advice, people continue to wear sneakers – but please, no sandals or flip-flops! The Smoky Mountains look their best after it rains, but this also makes things slippery on the trails. The Falls are always wet, of course, and rocks are slick with moss. It’s easy to slip and the terrain is unforgiving to the careless. Consider this especially if you have young or headstrong children with you – water accidents are the most common type of accident in the park, and you should always be careful. It doesn’t hurt to review what the national park says about water safety. Heading out to Grotto Falls makes a great day trip during your Smoky Mountains vacation. Not only do you get the ultimate reward of getting to walk behind a beautiful waterfall, but the journey out there provides you with fresh mountain air, the charge of rushing water, and compelling vistas. And access via the Motor Trail gives you an opportunity to change plans at the last minute if you decide not to take the hike, and still have a trail experience with the rest of the scenic drive. The whole trip need only take a few hours, and it’s the perfect prelude to an afternoon or early evening spent relaxing in the hot tub of your mountain cabin. 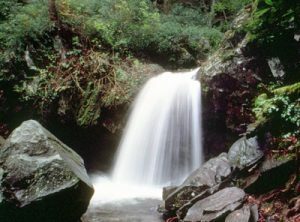 For detailed trail information, see the National Park’s Grotto Falls page, and this description from Hiking in the Smokies.